NMR is one of the most powerful methods for imaging of biomolecules. 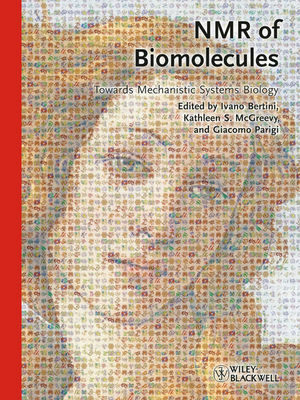 This book is the ultimate NMR guide for researchers in the biomedical community and gives not only background and practical tips but also a forward looking view on the future of NMR in systems biology. Ivano Bertini is a Professor of Chemistry and Founding Director of the Magnetic Resonance Center (CERM) at the University of Florence. His main research interests include advancements in nuclear magnetic resonance spectroscopy, the expression and preparation of metalloproteins, their structural characterization, and the investigation of their interactions, with an emphasis on understanding cellular processes at the molecular level. He has authored over 600 scientific publications and several books, and is or has been on the editorial staff or advisory board of over 20 of the most authoritative journals in chemistry, biochemistry and inorganic chemistry. He is a member of the Academia Europaea and the Italian Accademia dei Lincei. Kathleen S. McGreevy is a researcher in bioinformatics at the Magnetic Resonance Center (CERM) at the University of Florence. After obtaining a degree in Mechanical Engineering from the University of Virginia in 2002, she became involved in the support and management of research activities in the biomedical sciences before moving to her current position. She has been involved in the management of several European projects, notably the FP6-funded Coordination Action NMR-Life, from which this volume takes its inspiration. Giacomo Parigi, degree in Physics at the University of Florence (1992) and PhD in Chemistry, is Associate Professor of General and Inorganic Chemistry at the Magnetic Resonance Center (CERM) and the Department of Chemistry of the University of Florence. His research interests are mainly oriented to the study of NMR effects related to paramagnetism for the structural and dynamic characterization of biomolecules, to the analysis of the relaxometric profiles of paramagnetic systems and biomolecules, and to nuclear and electron relaxation.